As the summer research intern at Baltimore Innovations I worked with the R&D director, Mark Valentine, and Project Engineer, Mario Ferri, on a variety of different projects, from the beginning of August till mid-September. As a first-year student reading General Engineering, my knowledge of humidity and moisture was relatively limited. Thus my first few days, I was flooded with technical information and new concepts to master. Learning about silica gel, adsorption isotherms and moisture ingress was interesting however, and I enjoyed being able to put my knowledge of mathematics and chemistry together. The focus of my project was exploring ionic compounds as a way to control the humidity. It is commonly known, that saturated ionic solutions have different equilibrium relative humidity’s and could potentially be used instead in applications where the moisture level needs to be in a specific range, not just as low as possible. Already aqueous lithium chloride is used in desiccant cooling systems but applying this to packaging solutions could be a potential new product. I devised several experiments aiming to be able to characterise various ionic compounds and extract models to predict shelf-life and the humidity level that would be obtained during its shelf-life. 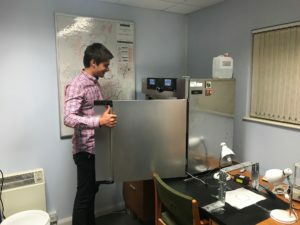 With the help of Mark, various humidity-transfer simulations were also conducted to look at how the humidity travelled within the packaging and how the desiccant was affected by long-term ingress. Being new to simulations, I found it quite challenging but very rewarding when I was able to visualise a desiccant reducing the humidity content and then becoming saturated and no longer being in control. A problem I encountered when performing some of these experiments, was that the length of these experiments varied from a few hours to a few days. This presents a few challenges in regards to collecting data. To measure the humidity or temperature, a logger can be used but when using scales for example, recording the data becomes harder. I thus built a program that was able to run alongside the experiment and record data at the required intervals, store it, and even send this to a remote cloud storage. This opens up various functionalities that could, in the future, be provided to customers when we test their products. Furthermore, it allows the experiment to run in an isolated environment whilst still monitoring its progress. During my six weeks at Baltimore Innovations, I also had the pleasure the join my colleagues on a company day out to the Ascot horse races and the Festival of Food & Wine. It was a nice day in which I was able to better get to know some of my colleagues with whom I hadn’t worked with in the past weeks. As a novice racegoer, I was sad to realise however, that the ‘beginner’s luck’ phenomenon is indeed a myth. Luckily that did not hamper my ability to indulge on the marvels of traditional Italian cuisine. That day also coincided with the end of my research and the start of report-writing for me, thus providing some welcome motivation. Ultimately, I enjoyed writing about my work such that Baltimore Innovations can further their investigation and I look forward to watching the success of their future products.